High Quality Content by WIKIPEDIA articles! Velocity Magazine is a monthly youth culture magazine published in the Omaha, Nebraska metropolitan area. Debuting in November 2005, it became the first publication specifically for and about Gen-Y in the eastern Nebraska and western Iowa region. Its monthly content ranges from Education, Sports, Media, Technology, Gaming, and Student Submissions. Velocity's Editor-In-Chief, John Sullivan, also encourages students to submit articles for publication on a regular basis. 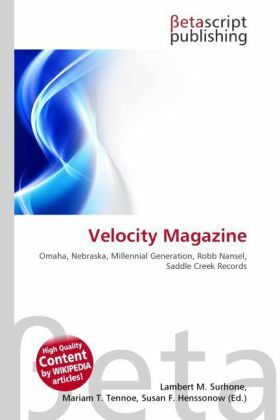 In its second issue, Velocity published an exclusive interview with Robb Nansel, the President of Saddle Creek Records. Besides having normal distribution spots throughout the area, it is also available in 85 high schools within a 50-mile radius of Omaha.